One of the subjects studied recently has been the reasons the "voter turnout" (the percent of people participating in elections) has been lower in United States, as compared to turnout for elections in other democracies. 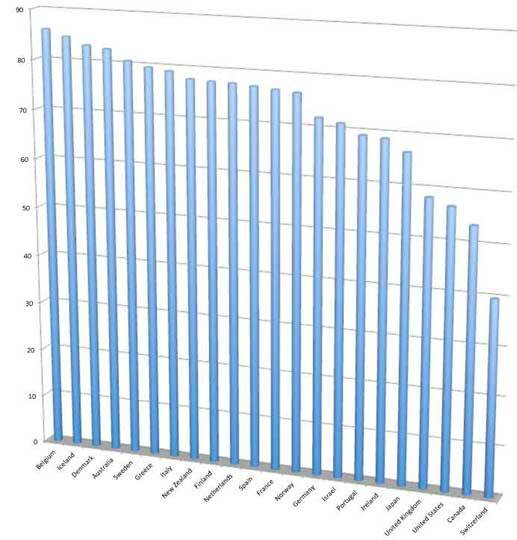 The chart below demonstrates how election participation differs from country to country. The participatory rate of voters in the United States is substantially lower today than it was in the 19th century. Over the course of the 19th century, over 80% of eligible voters participated in each US election. Of course, in the 19th century, the number of eligible US voters was much lower, since woman and other minorities were effectively unable to vote. State results in 1884What explains both the overall drop in voter participation, and America's lower voter participation rate, relative other democratic nations? A number of theories have been put forth to explain America’s lower turnout. Some of these explanations are plausible, and others are less so. One of the most popular theories seeking to explain sluggish US voter turnout posits that Americans have a more negative view of their government today compared to citizens of other nations. As a result, Americans, allegedly, do not participate in elections. I completely disagree with this theory. This theory may explain American voting patterns over the course of the last few years. However, I also do not really believe this to be the case. In fact, the truth is quite the opposite. All of the evidence gathered over the course of the last 50 years shows that Americans have a more positive view of their government than that of the citizens of many of the nations that have a larger voter turnout. A second theory on rates of voter participation posits that Americans feel their vote simply will not count. According to this view, voting is not worth the bother. There is probably some truth to this explanation. However, with the exception of the 2000 election, which was decided by a mere 320 votes, most American elections are decided by large margins. Moreover, the American Electoral College system, where each state, (with two exceptions) gives all of its electoral votes to one candidate, further distances a voter from the election results. In fact, there are so many states that are not considered competitive; as there is a foregone conclusion that one candidate or another will win. In these cases, voting can seem almost like an irrational waste of time. In many foreign countries votes are cast for a party that will then be part of a coalition government. In those cases, even small changes in the votes received by one party or another can affect the outcome of the government. The coalition system works to empower voters. A third argument attempting to explain changes in US voter turnout claims the fact that in the United States Election Day is a working day like any other day is a deterrent to potential voters. In other countries Election Day is a holiday. It is a fact these other countries have greater voter turnout. The final explanation given to try to explain lower turnout rates in the United States is the requirement for voters to pre-register in order to vote. Americans are required to re-register to vote any time they move residences. Statistics show that Americans move more often than citizens of most other countries. In addition, the US voting process is a two step process. Registration which has to take place at least 30 days before an election in most states, has to occur before most people have begun to concentrate on the elections. It is interesting to note that the requirement for voter pre-registration was only mandated in the 20th century. The introduction of required voter pre-registration corresponds with the decrease in voter participation in US elections. Another fact supporting the view that pre-registration hinders US voter turnout is that the few states that allow same-day voter registration have a higher than average turnout: From Minnesota with 77.7% to a low rate of 63.7 for Idaho in the 2008 elections. These rates must be compared to the overall US voter turn-out average of 61.6%. 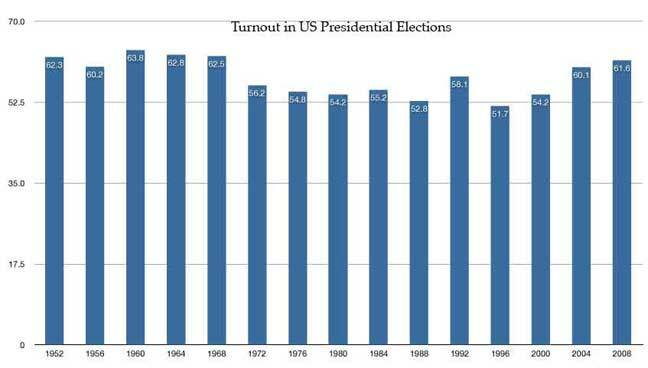 I do not think there is any one theory that fully explains the patterns of lack luster American voter turnout. In my opinion, a combination of the last three theories: a feeling that your vote will not matter; a busy schedule on election day; and finally the requirement to pre-register combine to keep US voter turnout continually low.